Amelia had her four month old well baby visit today even though she turns five months old in a few days. Our seven-week long visit to Indianapolis delayed her routine exams but better late than never! I am amazed at how long Amelia is. No need to discuss her weight, we already know she is chunky from her last visit! But in just almost five months, our little girlie grew five and a half inches! No wonder her 3-6 months pants look more like capris! She is healthy and developmentally on point. 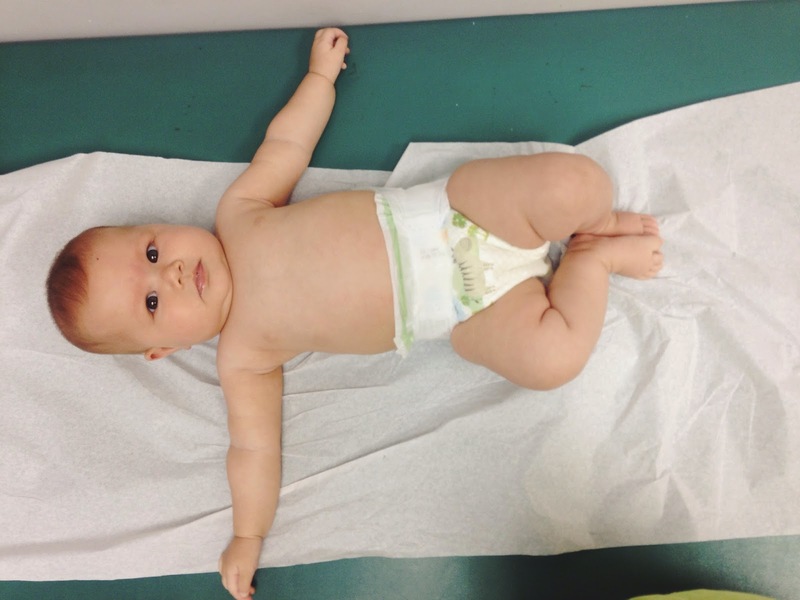 Amelia is still not rolling over and the pediatrician thinks it is because of her chunky legs. Haha! We also discussed her recent emergency department visits during our stay in Indianapolis. Her pediatrician here agrees with the pediatrician we saw in Indianapolis: it is too early to rule out if all the trouble was caused by just the virus or if we are starting to see the beginning of an asthma. Unfortunately for her, she has triple whammy because of me: family history, eczema and allergic rhinitis. So for now, we are keeping the nebulizer machine nearby in case she has another episode of breathing issues.